In the middle of Austria’s biggest ski and sports region, our 2 bedroom apartment is situated in the lovely village of Niedernsill which is a short distance to the ski resorts of Zell am See and Kaprun (glacier resort with year round skiing) and the newly opened ski station at Hollersbach which links in to the Kitsbuhel ski arena. There are lovely restaurants and bars in the village which offer excellent value for money. Free ski bus to Zell am See and Kaprun leaves from the village centre (150 meters from apartment) on a regular basis. In addition, there is a regular train(free with ski pass) and bus service from the village centre. The apartment is presented in a beautiful and cosy rustic style. It is on a raised ground floor and has its own terrace, which leads down to the garden. Austrian Alps and Salzburgerland: Salzburgerland is one of Europe's most beautiful areas. The scenery is stunning, encompassing high Alpine peaks as well as gentler impressive mountains. Salzburg, the birthplace of Mozart, is world famous for it's lovely architecture and cultural heritage. The people are friendly and helpful, retaining a strong sense of national pride combined with a welcome for the many tourists. Winter sports bring most visitors to this part of Austria, with famous ski resorts like Zell am See and Kaprun, but the lakes, clean air and flower-filled meadows make Salzburgerland a wonderful destination throughout the year. Whether you're looking for excitement in the high mountains or lazy walking in the meadows, or almost any outdoor activity, you'll find it here. Niedernsill and Surrounding Area: Niedernsill is a friendly and picturesque Austrian holiday village in the heart of the Austrian Alps, close to the world famous resorts of Zell am See - Kaprun, Saalbach and Kitzbühel. Niedernsill offers, both in Summer and Winter, a wonderful holiday location with breathtaking views of the Hohe Tauern mountain range and the Kitzbüheler. The village is a short distance to the ski resorts of Zell am See and Kaprun,( which provides year round glacier skiing) and the newly opened ski station at Hollersbach which links in to the Kitsbuhel ski arena. This apartment is perfect for a family holiday in this beautiful part of Austria. The communication before and during our stay was brilliant and made for a really relaxing holiday. The apartment was spotless and well equipped and the local agent is really helpful, happy to provide us with lots of helpful local tips. Whilst the obvious choice of ski area is the Zell/Kaprun area, you can also access the back of the KitzSki area within a 15/20mins drive. This area is great as there is a free nursery slope but also access to a huge ski area which was really quiet. The boot room is heated and great for storing boots and skis at the end of the day. Beautiful apartment, well kept, clean and tidy. The village is fabulous... So peaceful, lovely restaurants, good service of local buses and trains. For 2017 Christmas/ New Year period, we have chosen an area that we have previously been and loved In Austria. Yet this time, it was our first experience of this type of accommodation and, we were very pleasantly surprised how comfortable, homely, and fully equipped the flat was to ensure comfort in every aspect. Especially after an eventful skiing adventure, we really looked forward to cosy up in the lovely sitting room decorated nicely, with even a Christmas tree, and we would rather be home than outside. Kitchen was very well equipped with essentials and more, and everything was in perfect working order. And indeed flat was very clean and tidy throughout and even some games and books was available as a nice touch. And a garage we could store our Skis and boots. 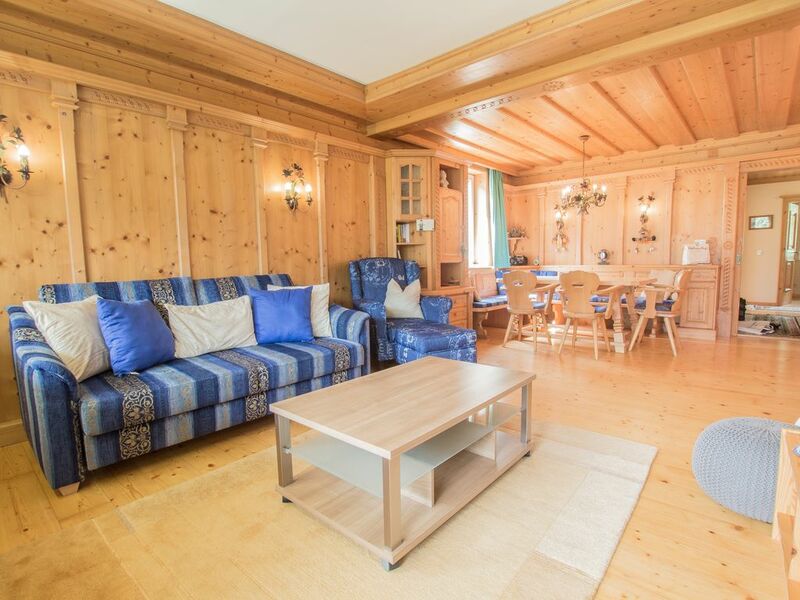 The location was great, in easy reach to Zell am See and Kaprun, with good amenities around. We especially enjoyed the spirit of this little village on New Years Eve, with all the neighbours putting a fireworks shows which lit the sky and lift the spirit. Marlene was very helpful with a pleasant spirit, and informative with tips, for resorts, weather and even for the route we would drive back to Germany. Fantastic apartment in an idyllic location! We have had a wonderful time on our first trip to Austria, the apartment was just perfect, Niedernsill village wonderful and the views breathtaking, a perfect base for visiting the many local attractions the area has to offer. The village has a bakery, bank and two shops all just a short stroll away with plenty of options for eating out. We tried all four different restaurants, with Martin's at the top of the village being our personal favourite! We couldn't get the children out of the lake which is just a short walk from the apartment and just perfect for kids and a great place to relax on a warm evening with a cold glass of the local beer or wine! Marlene was extremely helpful on our arrival and made us feel very welcome, sharing her local knowledge of the area and showing us around the apartment. The holiday has opened our eyes to a different area of Europe and we loved every moment. I imagine we will be making a return visit very soon, I might even persuade my wife to give skiing a try! As my son said to me on the flight home, 'Dad that's the best holiday I've been on!! We used the rail service for transport, which was very reliable and 5 minutes walk from the apartment. Trains are every 30 minutes to Zell am See. From Zell am See we hired bikes and kayaks & would have windsurfaced too but no wind! Last day did the most beautiful walk along the hillside through alpine meadows to Walchen. Tony, the owner, was very helpful with info both about the apartment and public transport. Apartment was fine (with proper mugs!) and Niedernsill a lovely quiet village with good bakery & restaurants. We had a lovely stay in Niedernsill between Christmas and New Years. There was plenty to do in the surrounding area with kids (pool, ice skating, skiing, sledding). The apartment is cozy, but has everything you need (dishwasher, washer, dryer, tv with English channels). I only wished there was a handbook for the apartment, we didn't know there was a ski room or how to sort and dispose of trash. I would highly recommend this apartment for a family of four, we hope to return next winter! Security deposit €250 payable locally Changeover/cleaning €75 payable locally Linen/towels €12 per person payable locally Tourist tax €1.15 per night per adult (children up to 15 free) Rates include the Fun+ Card for summer guests which provides numerous free and discounted activities.